You don't have to dig very deep to find articles discussing the big picture of The Wind Rises, Hayao Miyazaki's 2013 film documenting the life of Japanese aviation engineer Jiro Horikoshi that just began its wide release in America in the last few weeks. It's not difficult to understand why: the real life Horikoshi was responsible for the creation of the Zero fighter planes used extensively by Japan during World War II, most notably (to us in the West, at least) in the attack on Pearl Harbor. One can imagine the Zero Dark Thirty-esque hyperbolic responses to a film that arguably glorifies the work of a man whose actions resulted in the deaths of quite a few (to put it mildly) people in the Pacific Theater, both Japanese and otherwise. Miyazaki takes a notably different tack on his approach than Katherine Bigelow did with her film. Zero Dark Thirty took its moral questions and met them head-on, simply presenting events as fact and not adding any sort of editorial voice behind the scenes either exulting or condemning these men and women for their actions on the road to finding Osama Bin Laden. The Wind Rises approaches its events from a more lyrical and abstract standpoint, not only not particularly commenting on the events in a moral sense, but also not particularly acknowledging their existence on a direct level. Japan had a troubling past in the early 20th century, especially from the perspective of outsiders. Its transition into the modern industrial world was marred by wanton imperialism in Asia, culminating in their aggression during World War II. The Japan we know today is not the Japan of the 1930's and 40's. The airplanes for which Jiro has so much passion, his ultimate nexus of form and function, the flying work of art, were used exclusively as tools of war, both before and during the height of the Axis powers. It's a tricky balancing act one must play, choosing which aspects of Jiro's life to exult and which to squirrel away, and it's not a stretch to make the claim after the credits roll that Miyazaki did not concern himself very much at all with many of the moral implications of Jiro's story. He instead chooses to make the story as insular as possible. The real world consequences are framed through Jiro's own experiences and desires. It is made evident that all he cares about is the art of designing his planes, and doesn't give much thought to their eventual use by Mitsubishi and Japan, even as the drums of war loom in the distance. The film ends before the war begins in earnest, so we'll never entirely know exactly how Jiro feels when the plans hit the sky and rain death in their wake. It's plausible that were the film to continue, Jiro would have had to confront his feelings more directly. We'll never know. The real question at the heart of this turmoil lies in the responsibility of the filmmaker(s) in a case like this, and whether they should feel required to comment on the bigger picture that may exist beyond the scope of the film's story. The controversies themselves are at least partially created in this case by Miyazaki's decision to specifically frame The Wind Rises as a biopic of a real man whose life had real and deadly implications. Had he instead simply created the story of this man who, obsessed with the ideals of flight (a long-recurring theme of many of his other films), turns to the creation of airplanes as a release valve for self-expression, the film would have come and gone purely on the merits of its own narrative. Clearly, Miyazaki (a well-established pacifist; just watch Princess Mononoke) made the decision to document Jiro Horikoshi with full understanding of the implications of the man's actions. To assume ignorance would be naive. Indeed, Miyazaki is not hiding from Jiro's history. It's significant that Jiro's hero and dream-mentor, Gionvanni Caproni, is Italian (himself a real life aviation engineer). It's significant that Jiro travels to Germany to learn from their feats of engineering. The Wind Rises does not take place in some alternate view of the world, but simply one with a smaller scope. The treatment of Caproni is a fascinating one; Caproni's aviation career followed a similar structure as Horikoshi, and was himself responsible for more than his fair share of destruction through the planes he designed for Italy's air forces. But Caproni himself never actually appears of his own power in the film. He is only seen in Horikoshi's dream sequences, acting as a sort of guru (not simply a mentor), filling Jiro's unconscious head with ideas and ideals about the beauty and grace of airplanes. Thus, the relationship (one-sided as it is) is an ambiguous one: is Jiro's apparent disregard for the eventual consequences of his life's work due to some intimate knowledge of Caproni's own political ideology, or is the Caproni of Jiro's dreams simply a cipher for his own motivations framed through the reflection of his unknown mentor? Caproni is a construct, a sounding board for Jiro's own ideas and passions within his own head, someone whose character may or may not have any actual real life relation to the man himself. 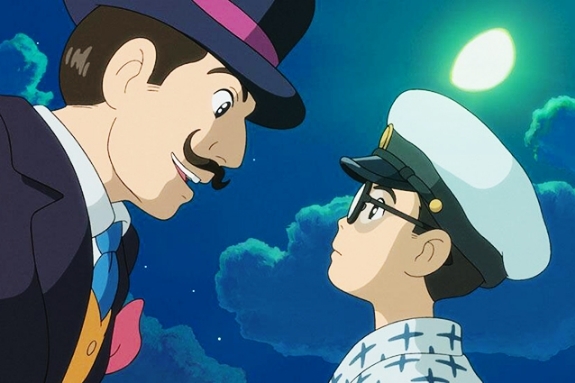 We see Jiro pouring over articles about Caproni as a child, so it is entirely possible that the real man served as an inspiration for both Miyazaki and Jiro. We'll never know purely from the film itself, as its sphere of influence is subjective. It is at this point that I'll be wading pretty deep into spoiler territory, for what it's worth. It's not until the very end of the film that Miyazaki chooses to confront the moral vagaries of the impending war directly (sort of). The final scene is another dream sequence, but one that has taken on a decidedly different tone. Jiro is, of course, in a more introspective mood, having just recently lost the love of his life to a long battle with tuberculosis, just as his first early prototype is seen as a huge success. Whereas earlier dream sequences had a marked whimsy in their content (at times encroached upon by darkness symbolizing the coming conflict), this final sequence is somber and muted. 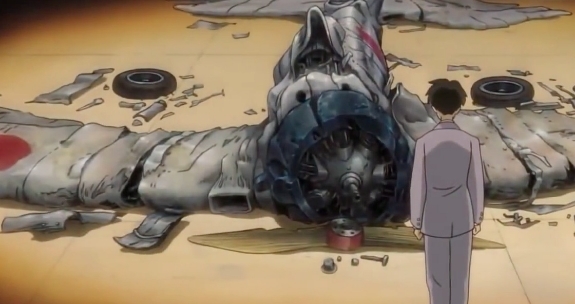 Jiro walks through a graveyard of crashed and destroyed planes, and while Caproni compliments him on his design and his taking advantage of his ten years of peak creativity, Jiro's response is notably different. While he acknowledges his good work, he also notes that none of his planes (or the people piloting them) will be returning from battle. It is clear that this weighs on his conscience, though not particularly clear is whether he considers the loss of the planes or the pilots to be a greater tragedy. It would be disingenuous (and in my opinion ignorant) for anyone to watch The Wind Rises and come out of it with the opinion that Miyazaki is glorifying Japan's actions during World War II or Jiro Horikoshi's (at least the Jiro Horikoshi of the film) involvement in the Japanese military. The final scene alone clears up any confusion there. It would seem, then, that the concerns among the film's detractors would fall into one of two camps: the film arrives at this conclusion too late, or it makes the characters overly sympathetic. It is true that Jiro does not concern himself much with the intricacies of war, or the politics of Japan or Italy or Germany, during the meat of the film. Indeed, he is told on multiple occasions that his plane designs would likely end up being used by the government to bomb America or China or parts of Europe, and he just shrugs this off, content in his own little world of finding inspiration for wing curves from mackerel bones. The decision to turn Jiro into a sort of secret revolutionary or moral crusader fighting against the tide of fascism may serve to placate the West, but would not serve to make any sort of sense both within the internal logic of the story Miyazaki is telling and within the logic of Jiro's life as an actual person. We must, of course, also be cognizant of the fact that this film was not made for us, but is a product of Japan and its culture. So the real question hinges on what Miyazaki's responsibility is as a filmmaker relating to a delicate topic like this one. Is he required to make a statement through his art either positively or negatively? In this case, is it possible to separate the work and life of the man (Jiro) from the consequences (the Zero planes and World War II), or is it necessary to conflate them? He doesn't have to tiptoe around it, as this isn't a children's film, so there's technically nothing holding him back from taking any sort of stance regarding the war that he chooses to make. But it is a situation of degrees. This would be an entirely different essay were this to be a film that attempts to paint Hitler or Mussolini or Hirohito in a positive light. But Jiro Horikoshi isn't those people. A better comparison would likely be if Pixar decided to make a film about the life of J. Robert Oppenheimer's life leading up to the creation of the atomic bomb. We know that Oppenheimer regretted his actions, but they still directly led to death and destruction on an unprecedented scale. Anyone in the States who lined up to see this film might be intrigued by how they handle the inherent controversy, but people in Japan would likely have a thoroughly different experience. It's all about our own baggage and opinions and perspectives on life and history and how that informs our view of a piece of art. That's the case with any work of art. Anyone can find controversy in anything if they work hard enough. We can go back and forth as much as we like about what we think the role of a filmmaker is when broaching controversial topics. But, even after you dig through it all, the final decision lies with the creator. His or her responsibilities can only be his or hers. Once external forces exert themselves on the art itself, whether due to studio pressure or societal pressure to perhaps handle a subject in the way that makes us most comfortable without challenging our own opinions, the art changes fundamentally into something else. The role of the filmmaker is what he or she makes of it. The efficacy of the art as art is what matters. Sometimes the thrust of that art is predicated on the way it stokes or responds to controversial topics. Sometimes a man is simply trying to tell a story that happens to find itself in the vicinity of a controversy but is not defined by it. But the common denominator is the story. If the story works, the characters resonate and the visuals inspire, the art is a success. That's what we have with The Wind Rises, regardless of all the external baggage.